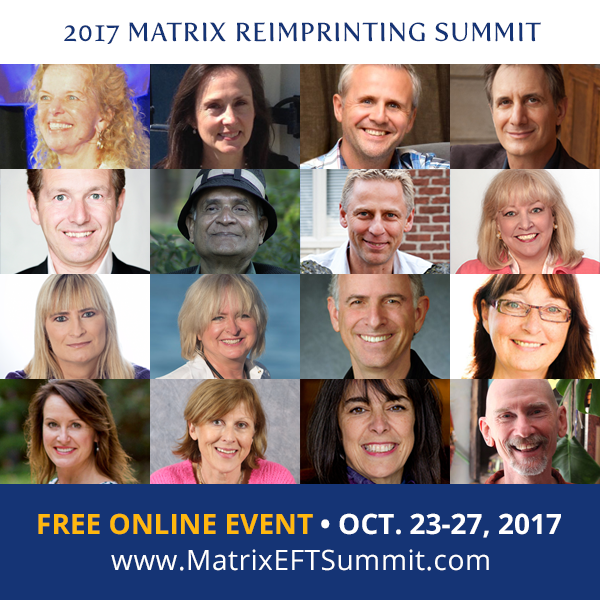 ​The 2017 Matrix Reimprinting summit has begun with in depth interviews with six amazing pre-summit special guests, including Donna Eden, David Hamilton and Amit Goswami, all of whom intimately understand the nature of energy healing and how Matrix Reimprinting is transforming peoples’ lives around the world. Starting Monday 23rd October our International Matrix Reimprinting experts and Practitioners join us each day to share their deep knowledge and experience of this life changing technique. How the fields of Energy Medicine and Matrix Reimprinting meet and complement each other. Why you find ways to sabotage the things that are most important in your life and what steps you can take to eradicate patterns and behaviors that keep you from having the successful life you deserve. How kindness as a practice may be even more powerful than the placebo as a way to heal yourself and others. How trauma, unbeknownst to you, can be passed down from generation to generation and impact your beliefs, your relationships, your vocation and more. The impact of epigenetics on your life explained simply. How to explore the paradigm that can explain why your specific health conditions can be traced back to specific adverse/traumatic life experiences and how to explore the connection in order to transform your health. Why Quantum Physics underlies the most powerful effects that Matrix Reimprinting has when seemingly miraculous results happen. What are the foundational key elements of Matrix Reimprinting and how it works to create such rapid transformation life changes by the founder himself. Rapid positive changes and healing occur every day when working with the matrix for people around the world, but sometimes the serendipitous and near magical nature of the work can rock your paradigm and you will hear some of those kinds of stories. How Adverse Babyhood Experiences (ABEs) and traumas can re-wire and infant’s brain/body and how those early events can re-shape your life and what you can do to reverse it. How Matrix Reimprinting can help us embrace our death as well as our life to create powerful changes in how we live our day to day lives. Why there might be a life design element at play in your life that is keeping your soulmate at bay and the #1 reason you haven’t met him/her yet. Why being a caregiver, helper, health care practitioner can lead to Compassion Fatigue and how you can re-create your own compassion fatigue resiliency. Why and how the implementation of color can literally catalyze your effectiveness in your healing work with yourself and others when working in the matrix, especially around issues related to feeling depressed. How to successfully integrate Matrix Reimprinting into a traditional psychotherapeutic practice. How to use Matrix Reimprinting to eradicate the longstanding effects of limiting money beliefs that make you feel like you will never reach the threshold of finally being beyond the struggle and riding the wave of thriving success. How to use Matrix Reimprinting methods to target that chronic pain that never seems to resolve no matter how many approaches and practitioner approaches you have tried that have offered temporary relief at best.